The desire is divided into two parts because of the “four phases of the Direct Light.” The first group of desires belongs to the root level, the first and half of the second level of thickness. The second group belongs to the second half of the second level –Bina, the third level, ZA and the fourth level, Malchut. But when the desire develops, every level includes all the levels that preceded it. In phase one there is the root phase, in phase two there is phase one and the root phase, in phase three there is the root phase, phase one, and phase two, in phase four there is the root phase, phase one, two, and three. This means that every level includes all the previous phases and it adds what mainly characterizes it. Phase four, Malchut, is actually the created being in which all the other phases are included, the vessels that absorbed the attributes of the Light and are therefore close to correction. 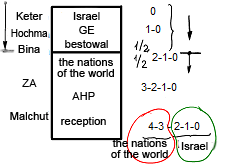 The purest levels of the desire that is in the created being is the root level and levels one and two are called “Israel,” while levels three and four are the other nations of the world that cannot correct themselves by themselves because the Light operates in the first levels while the desire determines everything in the last levels. Therefore the “Israel” desires can be corrected under the influence of the Light. They only need to draw the Light to them when they work against their ego. They still have a small desire to enjoy and it’s as if it doesn’t disturb them from getting closer to the Creator. The third and the fourth levels cannot draw the Light by themselves since their desire is so strong that they cannot even think about these corrections. But according to the thought of creation, it is these desires that have to be corrected since the fourth phase is the true created being and the Creator’s goal. Israel is the link between the Creator and Malchut that can absorb the attributes of the Light and with its help, when it’s incorporated and connected with the rest of the desire, to correct its thick part. So there is a mixing of the desires and as a result, Israel includes the nations of the world and the nations of the world include Israel. This incorporation comes from Above, but later there should be a clarification with the help of the work of Israel. This part of the desire that has penetrated deeply into the other layers can draw the Light that Reforms and with its help, clarify itself. Of course Israel has to feel the pressure of AHP, of the nations of the world who need this Light, so that the desire to draw the Light will be formed. Israel itself doesn’t need anything; it is initially only vessels of GE, Bina. But when it experiences the pressure of the nations of the world, it feels that it needs corrections. Then Israel draws the Light that Reforms and corrects itself when it connects to the collective body, GE. 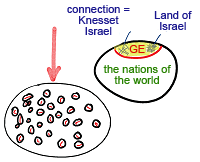 The collective desire that they build then is called the “Land of Israel,” and the connection among them is called “Knesset Israel” (the Assembly of Israel) or Shechina, the assembly of all the souls of Israel, since that part is already aimed at the Light (Israel meaning “Yashar El” – “straight to the Creator”). If Israel deals with the correction, the Surrounding Light begins to operate even on the second part of the desire, on the nations of the world, when it brings them peace. If Israel doesn’t worry about its correction, the nations of the world feel pressure and begin to pressure it more strongly. The nations of the world force Israel to unite whether in a good way or in a bad way. The process of correction is mutual: GE starts it and then the nations of the world join it. How the process will take place is up to Israel, whether they hasten time, which means whether they aspire for correction or not.